Aviation Safety - Dale Black - Capt. Dale Black - Author of "Flight To Heaven" and "Life, Cancer & God"
Since the introduction of FMSes in the early 1980s, avionics makers have made great strides in improving situational awareness by providing clearer messages on CDUs and by tying the boxes to MFD moving maps. However, several fatal accidents involving breakdowns in pilots’ situational awareness with respect to cockpit automation provide clear and convincing evidence that considerably more needs to be done to standardize and simplify interfaces between humans in front of the screens and the computers behind the screens so that pilots are not drowning in data. I like the philosophy of less is more and where color coding is standardized. The American Airlines Flight 965 controlled flight into terrain crash in Colombia in 1995 and the Cessna Citation CJ4 crash into Lake Erie in late December 2016 are two fatal accidents that involved critical failures in human/machine interfaces. I think this kind of standardization is long overdue and I make this comment as an experienced GA pilot. From what I’ve heard, it is a rare airline pilot who flies 1 aircraft type and even more rare one who flies aircraft from different manufacturers. 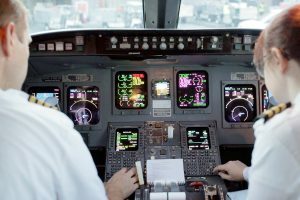 But in the GA world, many pilots switch between aircraft types regularly, and very few have a flight operations department to load the avionics for them. Plus the average legs are much shorter. I wonder how other GA pilots handle this issue? The video below was sent by a DBM Partner. You may enjoy this sample of crosswind landings (there are no accidents). Click the image below – Note: Different aircraft and varied crosswind components are involved but, can you determine which pilots use superior crosswind techniques than others? Enjoy. 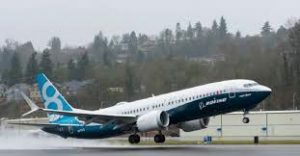 THE 737 MAX UPDATE: The Boeing Company confirmed on March 27 that new changes are proposed by Boeing to the 737 MAX’s maneuvering characteristics augmentation system (MCAS). 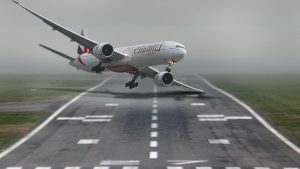 These adjustments will incorporate more redundancy into the aircraft’s flight-control law and should allow pilots ultimate elevator authority by limiting the degree of nose-down stabilizer command which the automated system can trigger. The VP of Product of Product Development and Future Airplane Development, Mike Sinnett, said the update improves the logic that triggers MCAS; boosts system robustness by feeding it with simultaneous data from two angle-of-attack (AOA) sensors, and places tighter limits on the movement of the stabilizer commanded by the system itself. The system’s modifications, being developed as a software upgrade, were first demonstrated for the FAA on March 12. The company will also update both training documentation and procedures. 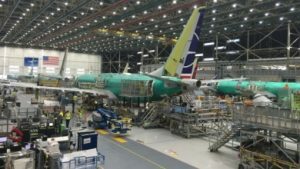 Boeing provided first details of the proposed software and training improvement package designed to return the fleet to service following its worldwide grounding earlier this month, even as new aircraft continue to roll off the Renton production line. The primary changes are to the operation of the MCAS flight control law in the speed trim system. 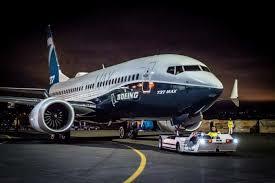 The MCAS, which has been successfully used on other commercial aircraft, was introduced into the newest version of the 737 to match aircraft handling characteristics with those of the 737 Next Generation. It helps decrease pitch-up tendency at elevated angles of attack. The changes in handling, which was found during testing in an extreme part of the flight envelope, were caused by the additional lift generated by the nacelles of the MAX’s larger CFM LEAP-1B engines which are located further forward than on earlier 737 models. 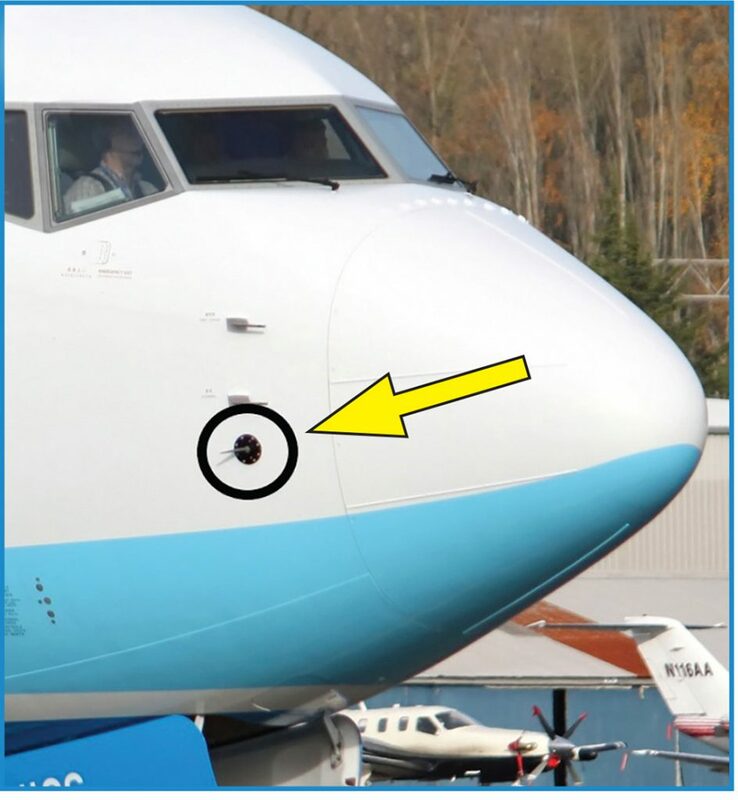 Providing a deeper insight into the fixes and the work behind the development of the package, Sinnett said the flight control system will now compare inputs from both of the 737’s nose-mounted AOA vanes. The data will be fed into both the aircraft’s flight control computers. If the sensors disagree by 5.5 deg. or more with the flaps retracted, MCAS will not activate and the speed trim system will not function for the remainder of the flight. If an AOA disagree occurs for more than 10 sec. it will be flagged on the primary flight display. “In addition, as a customer option, we provide the optional capability to display raw data for AOA. Most airlines do not select this because it is purely supplemental information. None of Boeing’s current training or procedures require AOA information,” Sinnett said. In the current MAX design, the MCAS receives input from only one sensor during each flight. The left and right sensors alternate between flights, feeding AOA data to the flight control computer and the MCAS. 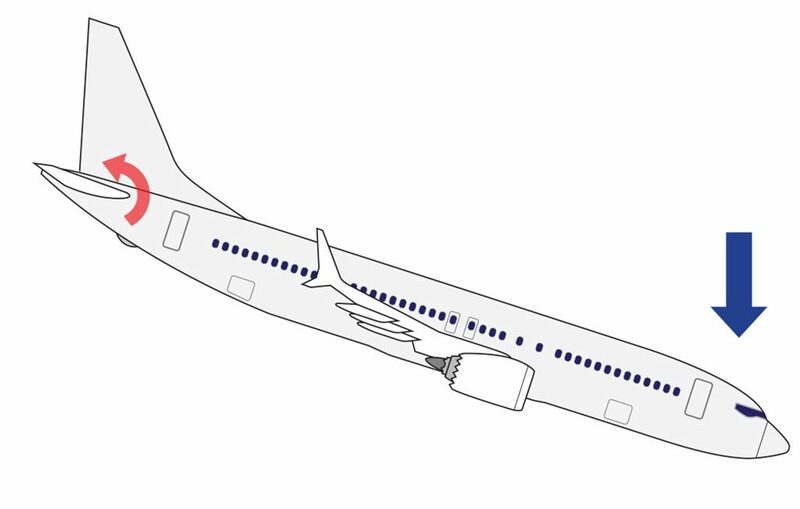 The single point failure potential of the original design has been criticized in the wake of the Lion Air accident where erroneous data appeared to trigger an MCAS activation. Personally, I’m pleased to see that Boeing has limited the system to now allow only one trim application for each new trigger of the MCAS system by an elevated AOA event. This revision means that the MCAS cannot command more stabilizer input than be countered by the crew pulling back on the control column. The company says its failure analysis of the system indicates there are no known or envisioned failure conditions where MCAS will provide multiple inputs. Under the original design MCAS trims nose down up to 2.5 deg. by moving the horizontal stabilizer at 0.27 deg/sec for 9.2 seconds, stops for 5 seconds, then trims nose down again for 9.2 seconds and continues to do so until the trim reaches the stabilizer travel limit or the crew intervenes. 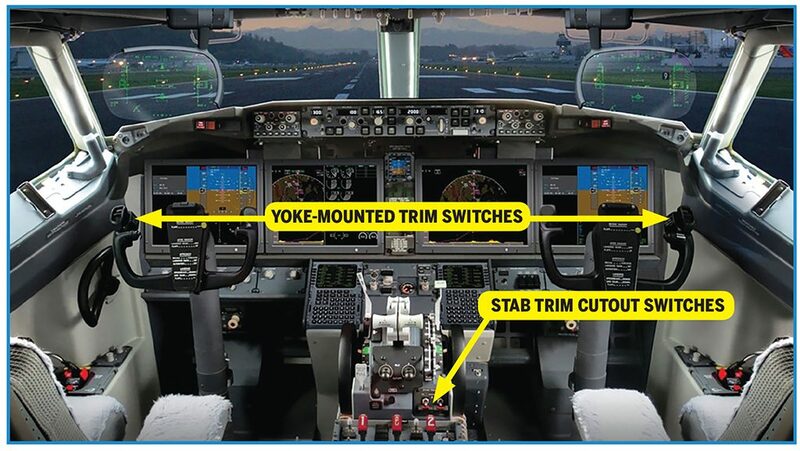 Boeing re-emphasizes the crew will retain the capability to override the flight control law using electric trim or manual trim, or by following the existing runaway stabilizer procedure and using the cut-out switches as reinforced in the Operations Manual Bulletin issued on Nov. 6, 2018. Changes to the training program include an updated level-B computer-based training program to enhance pilot understanding of the 737 MAX speed trim system, including the MCAS function and the associated crew procedures and software changes. Alterations are also planned for the Airplane Flight Manual and Flight Crew Operations Manual, as well as new notes for the speed trim fail checklist in the Quick Reference Handbook. Other changes are being made to the Airplane Maintenance Manual and the Interactive Fault Isolation Manual. 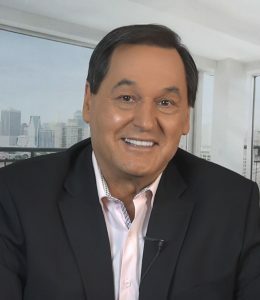 March 16, 2019: “Call me old fashioned … but…” read Dale’s commentary at the bottom of this article. March 16, 2019: The Boeing 737 MAX’s larger CFM Leap 1 engines create more lift at high AOA and, as a result, give the aircraft a greater pitch-up moment than the CFM56-7-equipped NG. The MCAS was added as a certification requirement to minimize the handling difference between the MAX and NG. This system activates when the aircraft approaches the threshold AOA, or stickshaker activation, for the aircraft’s configuration and flight profile. The 737 MAX flight-control law changes from speed trim to the MCAS because the MCAS reacts more quickly to AOA changes. In a sense it’s a fast acting stall prevention system. The MCAS’s primary data sources are the MAX ’s two AOA sensing vanes, one on either side of the nose. Interestingly, Boeing designed the MCAS to receive input from only ONE of the sensors during each flight. The left and right sensors alternate between flights, feeding AOA data to the FCC and the MCAS. What happens is this: when threshold AOA is reached, the MCAS commands 0.27 deg. of aircraft nose-down stabilizer deflection per second for 9.3 sec.—a total of 2.5 units of trim. When the FCC reads the AOA as back to below threshold, the MCAS is reset, and the aircraft’s trim returns to the pre-MCAS configuration. Inaccurate AOA data will trigger the MCAS every 5 sec. until the data is corrected or the system is disabled. By design the pilots can interrupt the MCAS in two ways: 1. via the yoke-mounted electric trim switches, or, 2. using the STAB TRIM CUTOUT switches on the center console. The trim switches interrupt the MCAS for 5 sec. and establish a new stabilizer trim reference point. Toggling both cutout switches de-powers the MCAS and the speed-trim system. Note: For decades as a precaution I have advised family and friends not to fly in NEW aircraft or aircraft of NEW design until that aircraft has concluded 24 months of continual flying service. For my family and loved ones this 2 year time frame generally provides adequate experience for the aircraft and crews to become adequately debugged and experienced. Updated 15:15 UTC, Mar. 14, 2019French air accident investigation agency BEA has received the flight data recorder (FDR) and cockpit voice recorder (CVR) that were recovered from the Ethiopian AirlinesBoeing 737 MAX 8 crash site. A BEA spokesman told Aviation Daily Mar. 14 the so-called “black boxes” arrived at 1 p.m. local time, four days after the Mar. 10 crash. Flight 302 crashed near Addis Ababa soon after takeoff. All 157 people on board were killed. The MAX is now grounded worldwide after FAA issued an emergency order Mar. 13 barring the aircraft from flying to or within the U.S., the last country to take such action. The groundings are based on concerns about similarities of the flight 302 event with a Lion Air 737 MAX 8 that crashed off the Indonesian coast Oct. 29, killing all on board. While the Lion Air crash is still being investigated, satellite and wreckage evidence indicate similar patterns. Information on the FDR and CVR may be able to confirm or rule out those similarities. The European Aviation Safety Agency (EASA) decided Mar. 12 to suspend all Boeing 737 MAX flight operations in Europe until further notice. EASA said in a statement that it has issued an Airworthiness Directive (AD) mandating the suspension “as a precautionary measure” and “following the tragic accident of Ethiopian Airlines flight ET302.” The agency also issued a safety directive suspending all 737 MAX operations by non-European airlines into and out of the region. Both decisions became effective at 19:00 UTC Mar. 12. The agency said it is “continuously analyzing the data as it becomes available. The accident investigation is currently ongoing, and it is too early to draw any conclusions as to the cause of the accident.” EASA was referring to the Mar. 10 crash of Ethiopian Airlines flight 302 near Addis Ababa in which all 157 on board were killed. The cockpit voice and flight data recorders have been recovered from the crash site, but data analysis is still pending. On Oct. 29, 2018, a Lion Air 737 MAX 8 crashed off the Indonesian coast. Early investigation results appear to show the maneuvering characteristics augmentation system (MCAS), introduced on the MAX, has played a role in the chain of events. The EASA decision was preceded by individual European Union member states which decided earlier on Mar. 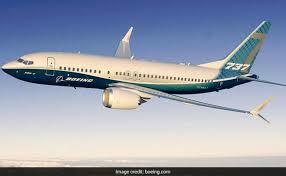 12 to ban 737 MAX operations. The UK went first, followed by Germany and France. Industry sources report serious behind-the-scenes disputes about the unilateral decision by the UK, which appears to have triggered reaction by other countries. Several more followed, including Ireland, Austria and Switzerland.